FINALLY! 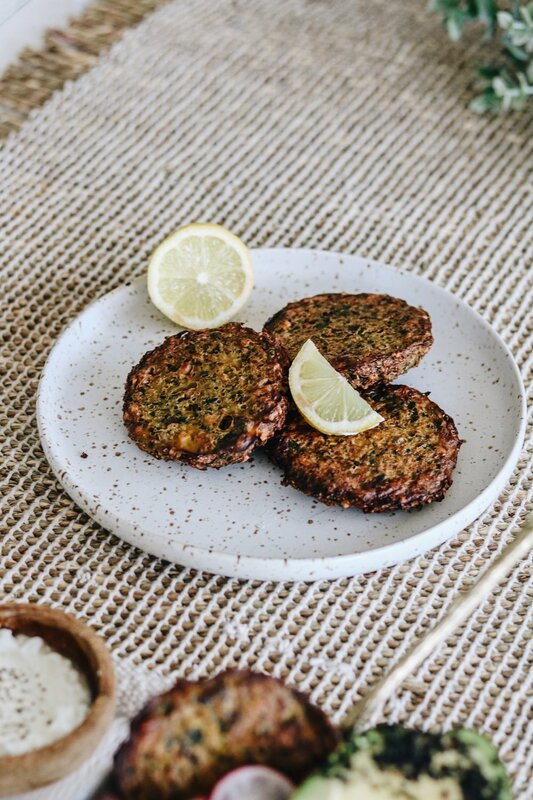 a bean and lentil free veggie Pattie recipe that will rock your world! Honestly, I don’t know where all the flavour comes from!? I think it must be @nutraorganics vegetable broth mixed with the roasted cauliflower? Also when I blend it, I kinda pulse it and leave it a rough consistency so there is still bits of crushed almonds all through it, gives the patties a bit of texture and crunch! saa gewwwd! I also added 1 cup of fresh spinach because I needed to get rid of it, these patties are an awesome way to add in any left over veggies you have in the fridge or to even sneak in a little more greens for some extra minerals, vitamins and fibre! Combine all of the ingredients into a high speed blender, I use a vitamix but a NutriBullet should also do the trick. Pulse until all the cauliflower has turned into grain like consistency and the almonds are just crushed. Portion out 4-6 hand sized patties, combining them with your hands. Placing on a baking tray lined with baking paper. Place tray into the oven to bake for roughly 30 minutes. Turning over half way. I served my patties in a buddha bowl with sweet potato wedges, sautéed oyster mushrooms, kale, avocado and a yummy dressing made out of greek yoghurt, olive oil and lemon juice! But would also be good on a bun ( I choose paleo or GF buns) served with your favour burger fillings.